For some months now, a group of us have gotten in the habit of walking from downtown to the North Market for lunch. We get some exercise and fresh air along the way, and once we reach the market we face a cornucopia of excellent lunch choices — and we are supporting local businesses, besides. I’ve sampled the cuisine at many of the North Market establishments, and I think its time that other downtown Columbus workers give the place a shot. So, I will be starting a periodic series on North Market lunch options in hopes of encouraging our handful of Columbus readers to wander down to the Market for their midday meals. Ah, the “usual suspects”! For my money, you can’t beat the cassoulet for quality, taste, and value. The cassoulet meal comes with two sides, and they are pretty good, too. 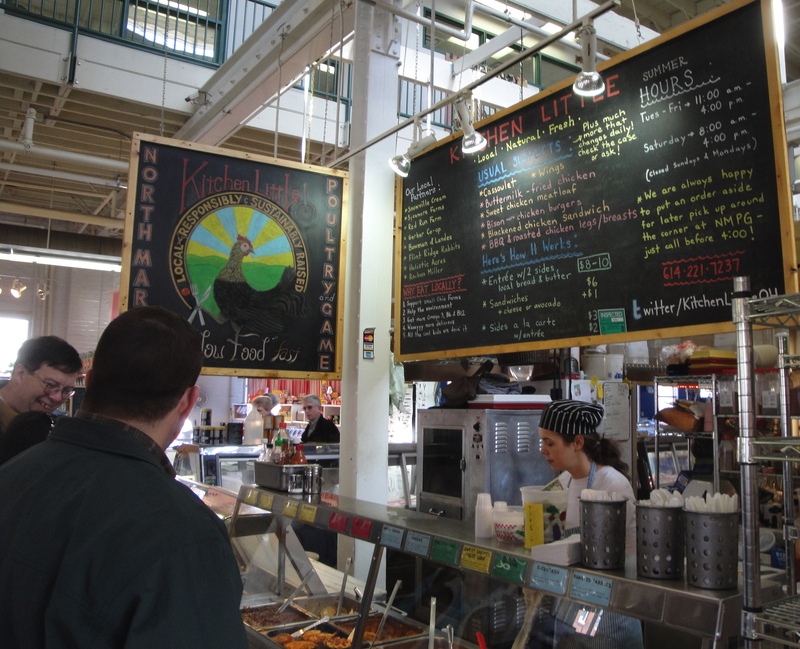 Kitchen Little usually offers several vegetables, macaroni and cheese, beans, and several different potato options. 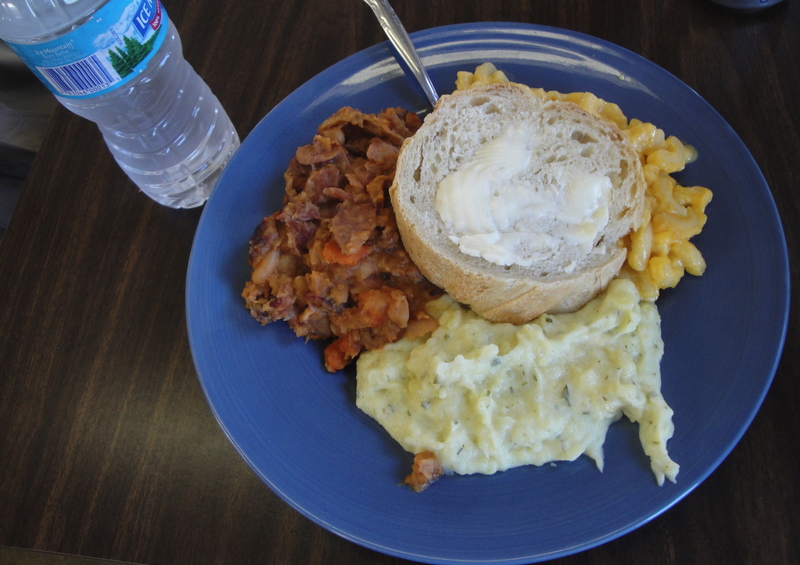 Today I got the cassoulet, mac and cheese, mashed potatoes, freshly baked bread with butter, and bottled water for $10. The cassoulet was tremendous — loaded with sausage chunks, multiple tender cuts of meat, and beans, in a rich sauce. The mac and cheese was well prepared, firm and not too cheesy, and the mashed spuds were well whipped with a delicate flavor. Terrific value for $10. Kitchen Little is a bargain — a kind of hidden secret of fine food, locally raised and carefully prepared, tucked away in a corner of the North Market. You really need to find it. 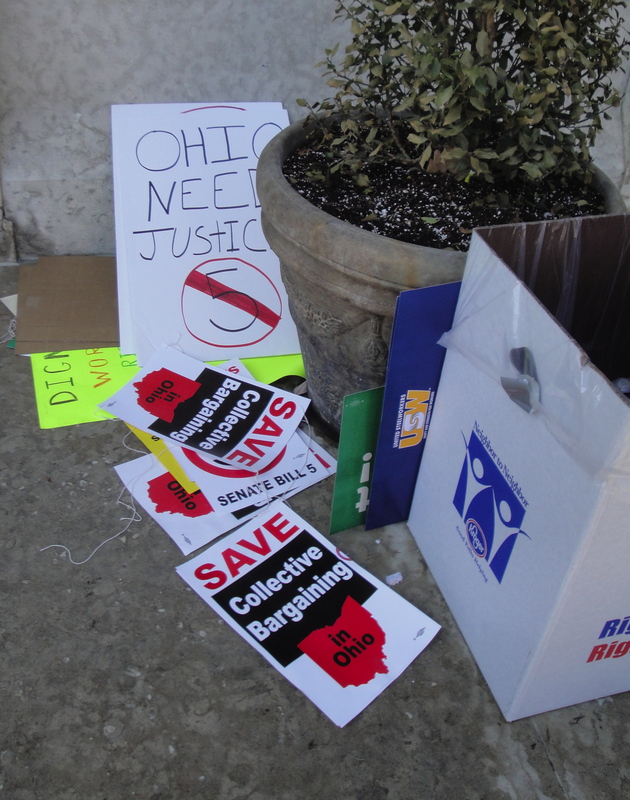 By a one-vote margin, the Ohio Senate today passed Senate Bill 5, the controversial legislation to modify the collective bargaining rights of public employees. The vote came as pro-union demonstrators again flooded the Ohio Statehouse and its grounds to try to stir up opposition to the measure. The union protesters manage to get six Republicans to break ranks with leadership and vote against the bill — but they needed seven defections to kill the bill. The measure now moves to the Ohio House, where it is expected to pass. Governor John Kasich supports the bill and would sign it if it makes it to his desk. I respect the public employees who came to Columbus to exercise their free speech rights and oppose Senate Bill 5, but I believe it is a necessary measure. Ohio is facing a huge budget deficit, and many Ohio municipalities also are facing budget shortfalls. A significant part of the state and local governmental budgets are devoted to public employees compensation and benefits. Senate Bill 5 seems like a reasonable step to deal with those costs. Public employees could still bargain about wages, hours, and working conditions, but not health care, pension benefits, or sick time. Public employees also would not be able to strike. The move should allow Ohio state and local governmental entities to bring public employee health care and pension benefit contributions in line with the prevailing approaches in the private sector, and the savings produced as a result will help to make up the budget shortfalls. We shouldn’t kid ourselves, however. Senate Bill 5 is not going to fix Ohio’s budget gap by itself. Our legislators need to roll up their sleeve and continue to look carefully, and skeptically, at state programs, state departments, and state agencies and decide whether they truly are needed, and if so at what funding level. What services are critical, and which provide non-essential services that we simply cannot afford any longer? Public employees in Ohio should not be the only group that bears the brunt of necessary budget cuts.